A lot of fuss over not very much news? I must admit to being both amazed and slightly peeved at the level of publicity generated by the Yale-NUS development in Singapore which is still a year from opening. It is also fascinating how much money seems to be being poured in and the kind of staff being appointed in advance of the first intake of students. An earlier post noted some previous news about the new College. Former Jonathan Edwards College Dean Kyle Farley will serve as the inaugural dean of students at Yale-NUS College, the school announced Thursday evening. Farley left Yale in fall 2011 to work at Academies Australasia, an educational group that serves international students studying in Australia. At the time, Farley said his move was partly motivated by his wife’s desire to return to Australia, where her family lives. The day before Wednesday’s announcement, Yale-NUS President Pericles Lewis said the new dean of students will be expected make decisions about how to address Singapore’s restrictions on political parties and public protests, and address any “gray areas” that might be found in Singaporean law. Yale-NUS also announced Thursday that Anastasia Vrachnos — former executive director of the Princeton in Asia program, which Lewis compared to the University’s Yale-China Association — will serve as the college’s dean of international and professional experience. During her tenure at Princeton in Asia, the program doubled its endowment, tripled its participants and started programs in 12 new countries. In addition to Farley and Vrachno, Yale-NUS has two other appointed deans: Dean of Faculty Charles Bailyn and Dean of Admissions Jeremiah Quinlan. In Asia, for the world. Yale-NUS College, a residential college located in Singapore, aims to redefine liberal arts and science education for a complex, interconnected world. Modest enough I guess. Further details of the venture can be found at its website here. There has been an awful lot of fuss over the new College and it is undoubtedly one of the more high profile international campus developments for US or European universities. But it still seems a striking level of coverage when the first intake, which will only be 150 students, is a year off and the total student population is likely to be around 1,000. On the other hand many of the staff, from the President downwards, do have great names. As the first liberal arts college in Singapore offering a proactive education through residential living and learning right here in the heart of Asia, we are breaking ground on multiple dimensions,” the inaugural President of the College said. The ceremony also symbolically lays the foundation for an inspiring and innovative community of learning, he added. To align with the School’s educational mission, the Yale-NUS campus architecture will highlight the collaborative nature of the venture through the joint expertise of two world-class architects – Singapore’s Forum Architects and US-based Pelli Clarke Pelli Architects. Distinctive features such as the syncopated skyline and special materials derived from Yale architecture are married with Asian courtyard landscapes to meld cultures, traditions and styles of Singapore, America and Southeast Asia. The East-meets-West setting will reflect the openness, energy and optimism of the College’s curriculum. This residential model builds “nested communities” in the Yale tradition of supporting lifelong learning in liberal arts and science by integrating academic, intellectual, social, athletic and artistic life. 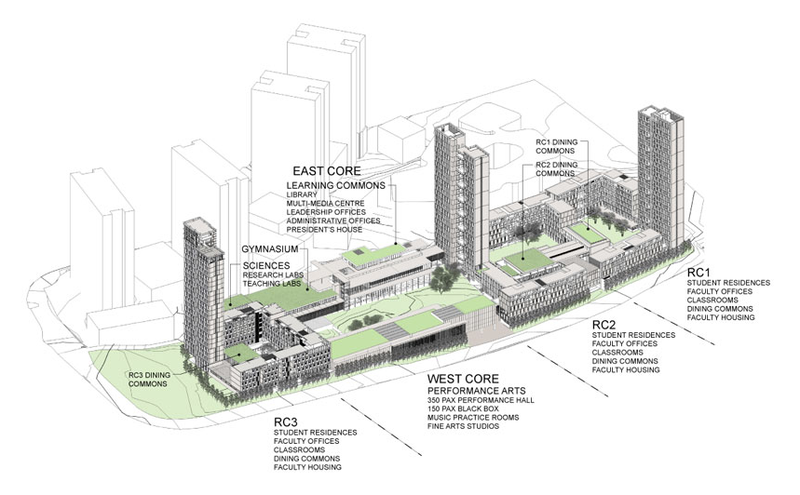 Three residential colleges, each conceived as a “social home”, will house students and faculty. The pioneer batch of Yale-NUS students will begin classes from August 2013 at UTown before the new campus officially opens in 2015. 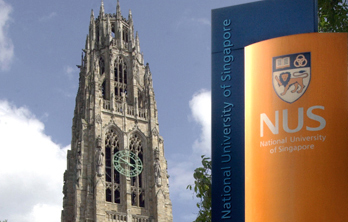 The location of the College on the same site is expected to provide opportunities for Yale-NUS undergraduates to interact with the NUS community in co-curricular, sports, the arts and other social settings. They will undoubtedly have some impressive buildings when the new campus opens. But will the development really break ground in “multiple dimensions” and will the ambitions of the architecture be mirrored in the academic enterprise? We’ll have to wait and see but, with the extensive media coverage of the new college, you would be forgiven for thinking that Yale-NUS had already opened and had thousands of students enrolled and that no other western university had opened a campus in Asia before. I do hope the new venture works and there is certainly enough money and good will behind it to ensure things do come together. However, the hype surrounding Yale-NUS College could mean that expectations are perhaps unreasonably high. And given the forthright views expressed by Yale faculty about issues from academic freedom in Singapore to the impact on their workloads caused by the need to support the new college it could be an interesting couple of years. Following the rash of recent world league table publications here is one that is based primarily on research. The rankings measure universities’ Research Performance Index or RPI. The table has been developed at the University of Western Australia and can be found here. Comparisons with the recent Times Higher Education and QS tables show some major similarities, they are all US dominated, but also some marked differences, particularly for Cambridge, Oxford and Yale. No such trouble with this much more entertaining effort (not entirely suitable for younger viewers in parts). The full tables, including subject rankings, should be available here. * A dramatic fall in the number of North American universities in the top 100, from 42 in 2008 to 36 in 2009, reflects the growing presence and impact of Asian and European institutions on the world higher education stage. Of these, McGill was the highest ranked Canadian University, up two places at 18th. * There are 39 European universities in the top 100, up from 36 in 2008. ETH Zurich is the top ranked continental European university at 20th place. Yale University said on Monday that it would reduce the average cost of studying in New Haven, Conn., by at least half for families with annual incomes below $120,000. The announcement came just a month after Harvard University announced a similar plan to reduce debt among students from middle- and upper-middle-income families. Under Yale’s plan, most families who earn $60,000 to $120,000 will contribute 1 to 10 percent of their income per year. Families with earnings of $120,000 to $200,000 will pay an average of 10 percent of their income per year, seeing a reduction of about 33 percent. Parents earning less than $60,000 will not have to contribute to their child’s education. In an interview, Richard C. Levin, Yale’s president, said that the university’s leaders had been considering the move for a couple of years but that two factors had influenced the timing of the announcement. One was that federal lawmakers have recently urged colleges to spend a larger percentage of their endowments on student aid. The other was the growth of Yale’s wealth: The university had a 28-percent return on its $22.5-billion endowment in the last fiscal year. Interesting that, whilst there is no OFFA equivalent, nevertheless there is a perceived pressure to improve student aid provision. And the scale of the endowment remains breathtaking. Yale, Harvard’s bitterest rival, revealed its plans on January 14th. Students whose families make less than $60,000 a year will pay nothing at all. Families earning up to $200,000 a year will have to pay an average of 10% of their incomes. The university will expand its financial-assistance budget by 43%, to over $80m. Harvard will have a similar arrangement for families making up to $180,000. That makes the price of going to Harvard or Yale comparable to attending a state-run university for middle- and upper-income students. The universities will also not require any student to take out loans to pay for their tuition, a policy introduced by Princeton in 2001 and by the University of Pennsylvania just after Harvard’s announcement. No applicant who gains admission, officials say, should feel pressured to go elsewhere because he or she can’t afford the fees. Which is good news for those who get in and pretty easy to do for Yale and Harvard given their endowments but it is no doubt the subject of much grumbling from other, less wealthy, institutions (and Princeton, where they did this seven years ago).